Nate Sudfeld is a restricted free agent. Adam Caplan tweets that the Eagles have slapped the quarterback with a second-round tender. The one-year tender will pay Sudfeld $3.095MM for the upcoming season. As a restricted free agent, the quarterback can negotiate with any club through April 19. If he signs an offer sheet with a new club, the Eagles could match the offer to keep him. If the Eagles do not match such an offer, they will receive a second-round draft choice. While Sudfeld has shown some intrigue in four NFL appearance, it seems unlikely that a team will offer him substantial money and forfeit a valuable second-round pick in order to add him. The 2016 sixth-round pick out of Indiana started his career with the Redskins. After being waived by Washington prior to the 2017 season, Sudfeld joined the Eagles practice squad. In two seasons with the team, the 25-year-old has appeared in four games (including playoffs). He got an extended look during the 2017 regular season finale, completing 19 of his 23 pass attempts for 134 passing yards. He also added another 22 rushing yards. 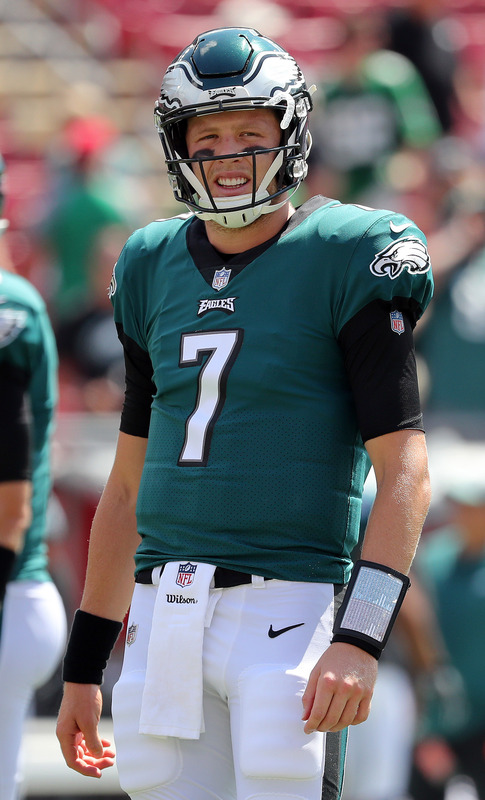 With Nick Foles out of the picture, Sudfeld will likely be the main backup to Carson Wentz in 2019. To that end, Ralph Vacchiano of SNY says the Giants won’t get serious about trading him “unless they are overwhelmed with an offer.” On the other hand, Vacchiano also says head coach Pat Shurmur was “furious” with him at times last year over his antics, particularly when he gave an interview to ESPN where he openly questioned the team’s quarterback situation. Vacchiano also writes that the Giants “are often closer to the breaking point than they may publicly appear” with Beckham Jr. It’ll be a fascinating situation to monitor as the offseason unfold. After flirting with retirement, Eagles center Jason Kelce ended up signing an extension with the team today. We now have details on the extension, as the new deal will make Kelce the highest paid center in the league, according to Ian Rapoport of NFL Network (Twitter link). Rapoport notes that the remaining three years on KElce’s contract will now pay him an average of $11MM per year. Kelce received Pro Football Focus’ top grade among all centers, so it makes sense why he’s being paid like it. Kelce is 31 now, and should have at least a couple more years left at an elite level. Speaking of retirement, we have more details on Jason Witten‘s role with the Cowboys in his return. While we’ve already heard Witten won’t be playing a full allotment of snaps, owner “Jerry Jones does not believe the veteran will be a bit piece in the offense,” according to Todd Archer of ESPN.com. Per Archer, Jones said this week that he doesn’t think Witten’s “a progress stopper”, and that he’ll be “well worth the roster spot.” It sounds like Witten could play a meaningful role in the offense even after taking the year off. The Eagles plan on having backup quarterback Nate Sudfeld back in camp next year coach Doug Pederson said from the combine, according to Les Bowen of The Philadelphia Inquirer (Twitter link). Sirius XM’s NFL Insider Adam Caplan tweeted in response that Sudfeld, who is a restricted free agent, is an “interesting player who could draw strong interest from other teams if they use the low tender.” Pederson did say that the team doesn’t “just go around and give out jobs,” but they wanted Sudfeld to compete to be Carson Wentz‘s backup. Assuming another team doesn’t steal him away with an offer sheet, it sounds like Sudfeld should slide in and replace Nick Foles as the primary backup in Philly. The Eagles‘ current plan does not involve a running back-by-committee approach. Instead, Jay Ajayi is the clear No. 1 ball-carrier coming out of Philadelphia’s offseason activities. Corey Clement, Darren Sproles and a to-be-determined cog will fill out the backfield behind the former Dolphins starter. Ajayi played well post-trade last season, averaging 5.8 yards per carry after gaining just 3.4 per tote in seven games with the Dolphins in 2017. No Eagle back averaged more than 11 carries per game last season, but Berman expects Ajayi to exceed that mark this year. Berman, though, does not anticipate the Eagles will re-sign Ajayi after this season due to the money he could well command after his contract year. This scenario would leave the Eagles in need come 2019, unless they view Clement as a potential every-down back. Nate Sudfeld has impressed during the Eagles’ offseason program. The No. 2 quarterback while Carson Wentz recovers, Sudfeld has given the impression he could handle backup responsibilities, Dave Zangaro of NBC Sports Philadelphia writes. This would come into play if the Eagles do decide to trade Nick Foles — for what would have to be a hefty haul considering their offseason-long reluctance on this front. But Sudfeld, a former Redskins sixth-round pick, has only thrown 23 passes — all in Philly’s Week 17 game last season. He did serve as the Eagles’ backup during the Super Bowl run, which is a fairly strong indicator of the franchise’s view of him at this point. The Eagles finally moving on from Mychal Kendricks has left them a bit thin at linebacker. Although Jordan Hicks is currently expected to be back and resume a three-down role, his injury history (having missed 17 combined games in his three-year career) can’t leave Philly too comfortable. However, converted safety Nate Gerry is firmly in the mix to claim Kendricks’ old job at weakside ‘backer, per Zangaro. A college defensive back, Gerry spent last season on Philadelphia’s practice squad. He, former Broncos special-teamer Corey Nelson and Kamu Grugier-Hill represent the viable competitors to line up in base sets alongside Hicks and Nigel Bradham, Zangaro notes. A 2016 Patriots sixth-rounder, Grugier-Hill’s worked as a special-teamer for the Eagles the past two years. Ronald Darby‘s experience, and the Eagles’ positioning as one of the favorites to win Super Bowl LIII, doesn’t add up to a preseason trade, Andrew Kulp of NBC Sports Philadelphia writes. The Eagles have Darby under contract for one more season, at an affordable $1.1MM, and boast a less experienced cornerback contingent than last season’s. Patrick Robinson departed, and Sidney Jones has played in one game. Darby inserted himself in the Jameis Winston saga, perhaps creating a slight off-field hiccup. But the former Bills starter graded as by far the Eagles’ best corner last season, in the view of Pro Football Focus. The Eagles are not expected to sign a veteran quarterback to back up Nick Foles, ESPN’s Adam Caplan reports (via Twitter). Instead, the team will continue to deploy Nate Sudfeld as the No. 2 signal-caller. Per Caplan, the Eagles have been so impressed with Sudfeld in practice that, even though he has never played in a regular season game, they believe he would do well if he were pressed into action. The Indiana product was drafted by the division-rival Redskins in the sixth round of the 2016 draft, but he failed to make Washington’s roster out of the preseason. Philadelphia has apparently liked Sudfeld for some time, as they gave him a generous practice squad salary and a two-year contract after he was cut by the Redskins. The Eagles, of course, were forced to put Carson Wentz on IR earlier this week after he tore his ACL in last week’s win over the Rams, which put a serious damper on their championship aspirations. Nonetheless, team owner Jeffrey Lurie told Ian Rapoport of NFL.com that his team invested a lot of money in the backup quarterback position for a reason (Foles signed a two-year, $11MM deal with $7MM guaranteed this offseason, putting him among the highest-paid pure backups in the league). Lurie said that Foles thrived in Philadelphia under then-head coach Chip Kelly, when the talent surrounding him was not nearly as strong as it is now, so he expects Foles to perform well the rest of this season. It sounds as if he also expects Sudfeld to do well should that become necessary. Sean McVay’s praise of offensive tackle Andrew Whitworth underscores how much the Giants blew it by not signing him in free agency, James Kratch of NJ.com writes. Recently, Giants GM Jerry Reese indicated that he did not go hard after Whitworth because he wanted to have a “younger football team.” His offensive line might be younger without Whitworth, but it is also porous. On the brink of a second straight trip through free agency, it sounds like Eddie Lacy is going to get an opportunity to showcase his stuff. In the second half of the season, Seahawks head coach Pete Carroll and offensive line coach Tom Cable say that they will try to make Lacy the team’s true No. 1 tailback. “We’ve always tried to do that (establish one running back),” Cable said (via Bob Condotta of The Seattle Times). “So maybe we have gotten lost in ourselves a little bit, too. But yes, we want to get cleaner blocking first and foremost, and get a runner established.” So far this season, Lacy has 108 yards on 42 carries, giving him a career-low 2.6 yards per carry average. Lacy is playing on a one-year deal with Seattle worth up to $4.25MM. The Eagles gave quarterback Nate Sudfeld a two-year deal, according to Adam Caplan of SiriusXM (on Twitter). The Eagles want to see what Sudfeld can do in training camp. If nothing else, he can serve as their third arm during OTAs. The Panthers gave some thought to promoting Mose Frazier from the practice squad this week, coach Ron Rivera told reporters (Twitter link via Joe Person of the Charlotte Observer). Instead, Carolina signed Brenton Bersin because of his familiarity with the team’s system. A spot opened up for a wide receiver when Carolina traded Kelvin Benjamin to Buffalo at the deadline. The Dolphins made Lawrence Timmons‘ suspension shortlived, reinstating the linebacker earlier this week. Timmons addressed his status, albeit vaguely. Adam Gase also said there’s a possibility Timmons could make his Dolphins debut Sunday against the Saints in London. Timmons declined to say why he went AWOL from the team before Week 2. Gase said he and Timmons “worked through a couple of things,” adding he feels confident the linebacker will be able to contribute to the team. The former Steelers linebacker was said to have visited his old team’s facility during the Dolphins’ Hurricane Irma-induced bye in Week 1. Timmons would be a welcome addition to a Dolphins team that remains thin at linebacker, even after the Stephone Anthony acquisition. Will Fuller looks set to return Sunday for the Texans, Bill O’Brien said (via Aaron Wilson of the Houston Chronicle). The 2016 first-round pick broke his collarbone during training camp and was expected to be out up to three months. This would put the Texans‘ No. 2 wideout on the front end of that timetable. Fuller will be working with another new quarterback, with Deshaun Watson having taken the reins since the former Notre Dame speedster was last healthy. Kelvin Benjamin also figures to be ready for his team in Week 4. After suffering a knee injury in the Panthers’ Week 3 loss, their top receiver avoided a serious setback. And Ron Rivera, via David Newton of ESPN.com, said barring a setback Benjamin will suit up against the Patriots. Redskins backup offensive lineman Ty Nsekhe will miss three to six games with a core muscle injury that required surgery, Adam Schefter of ESPN.com tweets. The 31-year-old has functioned as a part-time player in Washington since 2015, stepping in for left tackle Trent Williams during his four-game suspension last season and working as a reserve so far this year. Linebacker Eric Pinkins worked out for the Cowboys on Thursday, Wilson tweets. Pinkins played in 11 games between 2015-16, for the Seahawks and Giants, before failing to make the Giants out of training camp. The Cowboys have two linebackers on their injury report, Sean Lee and Anthony Hitchens. Neither got in a full practice Thursday. Quarterback Nate Sudfeld may have landed on the Eagles‘ practice squad after failing to make the Redskins out of the preseason, but Philadelphia sweetened the deal for the second-year quarterback. Sudfeld’s practice squad salary is $540K, Joel Corry of CBS Sports tweets. That’s nearly $32K per week, a rather notable increase from the league minimum squad pay ($7,200 per week). He’ll earn more than some of the players on Philly’s 53-man roster. Sudfeld spent his rookie season on Washington’s active roster.